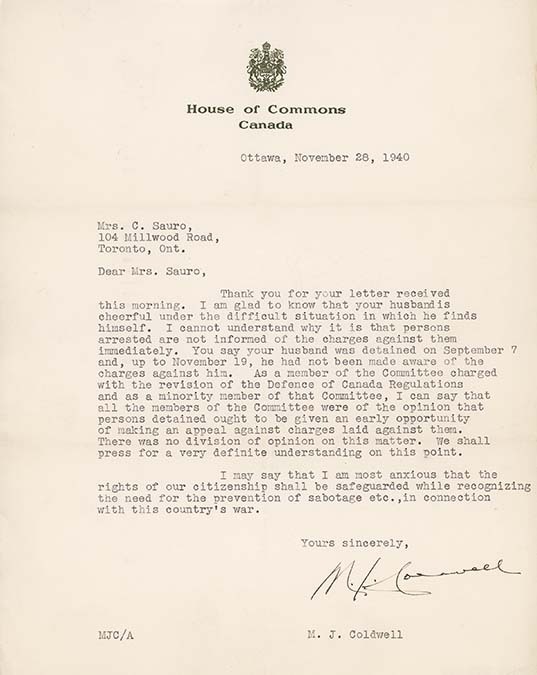 Letter from M.J. Coldwell M.P., to Mrs. C. Sauro, November 28, 1940. From his arrest, Clementina was relentless in her mission to have her husband released. She wrote many letters on his behalf, including letters to M.J. Coldwell, an M.P. from the Co-operative Commonwealth Federation of Canada Party (CCF). Coldwell did indeed follow-up with Clementina, as seen in this letter. In fact, he raised the issue of Libero’s internment in the House of Commons, pointing out that Sauro’s sons were in the Canadian services. Other letters indicate that Coldwell continued to interest himself in Sauro's case and those of other internees (see ICEA2010-0008-0051, ICEA2010-0008-0052, ICEA2010-0008-0053). In this letter, Coldwell notes that internees were not informed of their legal status right away. Under the DOCR (Defence of Canada Regulations), after 30 days, internees could formally object to their detention to an advisory committee appointed by the Minister of Justice. The Minister of Justice then appointed a judge to review the internee’s case. This meant an examination of the RCMP’s evidence against the internee, meetings with the internee, and interviews with witnesses who could attest to the internee’s character. After this, the judge either recommended an internee’s release or continued internment to the Minister of Justice. As Coldwell suggests, the result was a delayed and lengthy process. Sauro, who had much support from the United Church and with much effort from his educated wife, still would be interned for just under four months as a result.